Last week we erected a Self Erecting Crane near Liverpool Metropolitan Cathedral for a hire period of approximately four months. The Pedestrian Operated Tower Crane, a Potain T85A, is the largest Self Erecting Tower Crane on the Mantis Cranes hire fleet with a 45m jib. It can provide a maximum lifting capacity of 6,000kg at the tower and up to 1,250kg at the end of the jib. The height under hook at at the tower is 33m and 35m at the end of the jib. 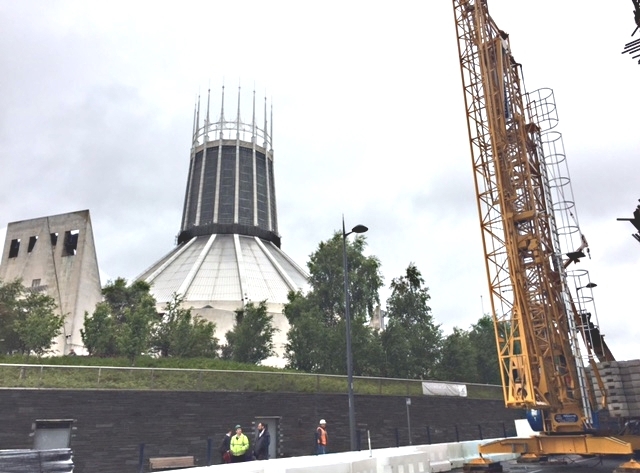 The project is at the University of Liverpool campus and involves the crane being erected on the centre of a roadway outside the Continuing Education offices. There will be roof repairs and some refurbishment as well. How are the Self Erecting Tower Cranes moved from site to site? Can Pedestrian Operated Tower Cranes be erected and dismantled easily on site? Is there any danger of the operator overloading the Pedestrian Operated Tower Crane? What power supply is required to run the Pedestrian Operated Tower Cranes? What type of base is required to erect the Pedestrian Operated Tower Cranes?